Former FCC Wireless Bureau Chief Fred Campbell told Breitbart News in an exclusive interview on Monday that “We the people should decide” whether Google, Facebook, and Twitter can censor and block content. 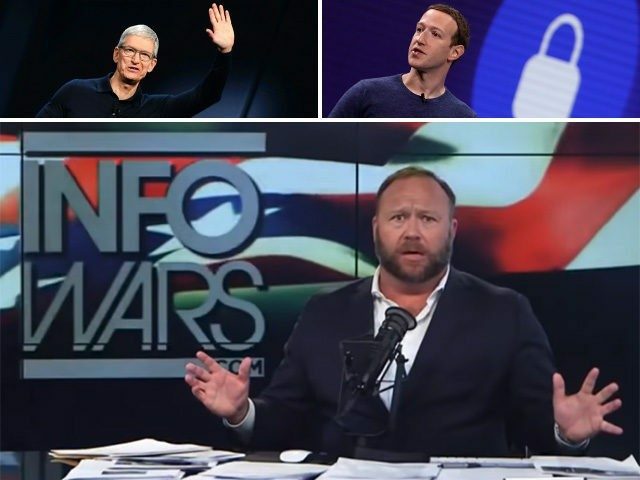 Silicon Valley giants Apple, Facebook, YouTube, and Spotify banned Infowars from their platforms on Monday, which has raised concerns about the free state of the Internet. In an interview in April, the former Federal Communications Commission (FCC) wireless bureau chief told Breitbart News that the Safe Harbor provision in Section 230 of the Communications Decency Act allows social media giants to censor at will. Internet service providers (ISPs) and edge providers such as Facebook and Google can host or publish other users’ content without being legally liable for their users’ content. Campbell called for the Safe Harbor provision to be repealed, contending that it violates the First Amendment and overrides common law protections against libel and other falsehoods. If they want the ability to edit the Internet and take down Alex Jones, then they should not have Section 230 immunity. If they’re acting like a publisher, which is what they’re doing, they’re doing the same sort of editorial decision making that newspapers and other print publications have been doing since immemorial, if they want to do that why are they not subject to the same rules that the print media is subject to? “They’re subject to a legislative exception that is a couple decades old, overturning a century of law. If they want to play editor, great, then comply with the laws that all of the others editors comply with and give up your special exemption,” he added. The former FCC executive continued, suggesting that could solve the issue of Silicon Valley censorship without regulation by using antitrust action. Repeal Section 230 and use Antitrust second. It really bothers me that the theory behind Section 230 is that the justification for it is that these online platforms are too big to edit. They won’t’ be able to edit, they won’t be able to track everything, well they certainly have been able to keep track of Infowars. They have just undermined the basis for their exemption from the law. Campbell, the director of the tech policy think tank Tech Knowledge, told Breitbart News that he believes that private companies should be able to curate content. However, monopolies such as Google and Facebook should not be able to have so much leeway to censor. “I believe that the government should not be regulating private entities’ ability to block content or censor … the First Amendment generally protects a person’s free speech, “Campbell explained. “We the people should decide whether private enterprises can block content, if we don’t, then under what circumstances, and then based on those decisions, apply that decision fairly across the board,” he added.